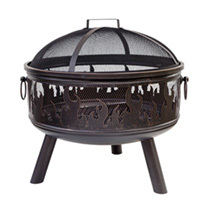 This highly impressive steel La Hacienda Wildfire Firepit is positioned off the ground on three tubular legs. The Wildfire Firepit benefits from having mesh sides with a decorative flame effect pattern running around the edge. 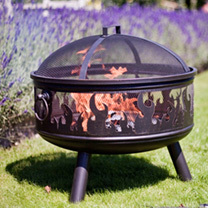 The Wildfire also has a domed spark guard top which is useful if you are using crackling logs as it will help to prevent sparks from flying out of the firepit. The aesthetics of this firepit are made more significant by its bronze colour making it stand out from many others of its comparable firepits. Height 61cm; diameter 61cm.